By all accounts, my dear ol' parents are about to embark on a Spring cleaning crusade throughout the house, starting with clearing out their creaking loft. I know this because when I visited them at the weekend they announced that once all the tuut* was down, I had a week or so to reclaim any prized Prince vinyl or Kylie Minogue posters. After that, everything was destined for either the dump or for eBay and knowing how ambivalent they've been in the past, I better get back over there pronto. Because the last time they did this, Mum took all my shiny 1980's Star Wars toys, complete with boxes, and sold them for 20 quid at a car boot sale. Oh the horror. Strangely, given that my parents are so unflinching and unscrupulous when it comes to these things, there are some items of precious that they will hold onto steadfastly, like condiments and spices. Again, pointing towards my mother, she loathes to let go of anything from her store cupboard. "Don't chuck that musty jar of dried thyme! There's life in it yet!" she'll often say. Apparently the other day Dad found some Coleman's English mustard powder where the use-by date of April 1988 was stuck on the bottom of the tin. As he tried to discreetly stow it away into the bin, Mum spotted what he was up to and leapt onto his back and started clawing and wailing like a banshee. He said it took him nearly half an hour to shift her before he could lock her in the bathroom and call the police. OK, maybe that didn't happen but Dad has made some repairs to their kitchen and repainted it recently, so that's why my suspicions are raised. Coming back to the matter of hoarding spices and herbs and such, I do think we are all guilty to a certain extent of holding onto those little jars for too long. My spice cupboard for instance should be a treasure trove to dip into; an Aladdin's cave of fragrance and colour to inspire and create. Yet in reality, it is a narrow crowded prison where a certain pecking order dictates. New inmates at the front beam outwards for a while but slowly and surely they soon get pushed to the back, towards a dark tomb, full of half-empty duplicates and stale, forgotten souls. It's a sad state of affairs really. However, I have just discovered a new way of storing spices which comes in the round shape of a Masala Dabba. Now you may well be rolling your eyes at this point, scoffing at the mere suggestion that using a circular tin to contain your turmeric, cumin and mustard seed etc all altogether, yet in separate pots is something ground breaking and new. Especially if you are Asian (though not necessarily). But I have arrived late to the party this time around and having been sent one from The Spice Kitchen to try, along with some very fresh and aromatic spices, the application of keeping a Dabba by your cooker has been revelatory. I like to make curry but I don't do it that often, perhaps once a fortnight and there are times when I've submitted to the shameful twist of a lid and the dumping of some gloop onto slices of onion and pieces of chicken. Lazy, bad Food Urchin. And when I go all out for the authentic approach, the aforementioned narrow spice cupboard gets a cursory fumble and then bang, off I go, down to the shops to buy stuff that I probably already have. Lazy, bad, wasteful Food Urchin. Of course the beauty of using a Masala Dabba is that you generally keep all your constitutive ingredients in one place. Very handy that and as long as you can remember what is what, the possibilities for experimentation are endless. A teaspoon here, a teaspoon there, shades of this, shades of that, well it's almost like painting. Although in my opinion too much chilli will almost definitely spoil your canvass. Most importantly, you can keep an easy eye on stock levels and cut down on those furtive supermarket raids and accumulation of jars. So what a lovely and simple piece of ancient cooking kit this is indeed. 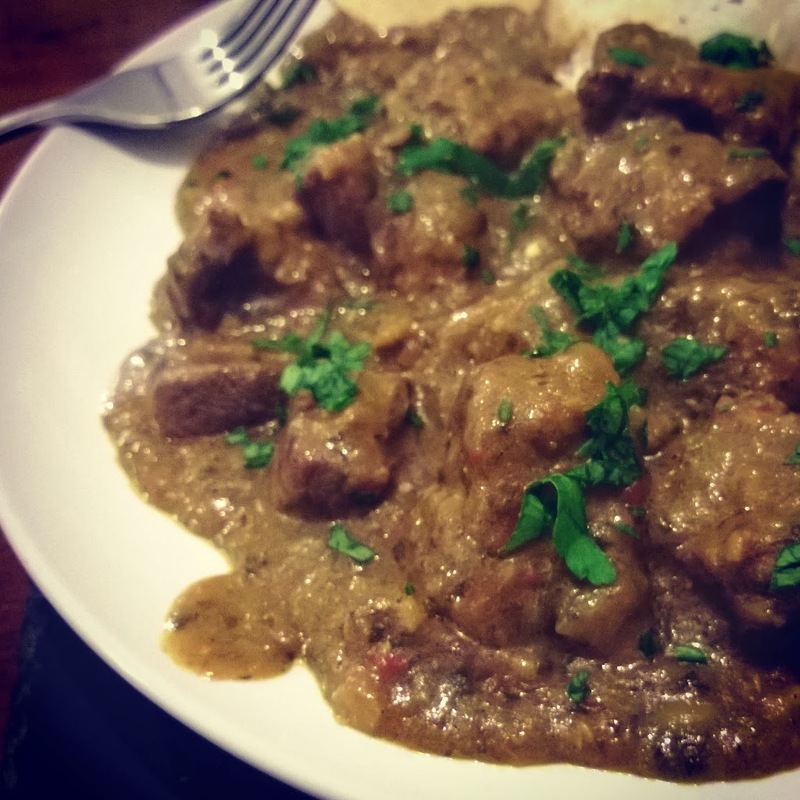 For a first run out with my new found friend, I used a basic curry marinade recipe as suggested by the good folks from The Spice Kitchen (who are based in Birmingham by the way) and as it was a corker, I am sure they won't mind me re-posting. I particularly liked the addition of tamarind as it lent lovely notes of sour and sweet to the mix, reminding me of rendang curries from the past. I do think the chosen meat of Blackface mutton from Turner and George also made a difference to the overall flavour. It was strong but after a nice long, slow braise was so so good and tender and complimented the spices perfectly. If I did have one little whinge about using a Masala Dabba, it would be this, the lid on my Dabba takes the strength of ten thousand men to prise it off. Whether this will loosen in time or whether this is deliberate to keep the spices within air tight, thus extending their lifespan, is beyond me. But if these hands, these grubby gorilla hands always have to ache after using this ingenious little device, I could eventually get fed up with the pain and the Dabba may well get stuffed into the tiny cupboard with the rest of the jars. But in all honesty, I doubt it. It won't fit for a start. This versatile mixture works both as a curry paste and marinade ideal for making a tasty dish with the meat, fish or vegetables of your choosing. If you plan to marinate chicken, pork, lamb, or beef, let it soak overnight; with fish, 3 hours will more than suffice. The amount this recipe yields is ample for marinating 500 – 750g of meat, fish or veg. Cover, chill and store until required, or immediately use the mixture to thoroughly coat your meat, fish or veg and leave to marinate as directed in the introduction. When ready to cook, heat some flavourless oil (choose one with a high smoke point), infusing it with curry leaves, cinnamon and cardamom for added flavour, before adding your marinated meat, fish or veg and frying until cooked and tender. Now you have two choices; you can eat this as it is as a ‘dry dish’ with naan and salad, or add water or coconut milk and allow it to cook into a cracking curry – perfect with mounds of fluffy rice! I had an inkling you wouldn't dismiss the dabba as just another piece of kitchen toot...tuut...tut alors! When we finally go and gnaw those Brick Lane brains you can get some more offally nice inspiration for further spicy creations. The problem for me with these dabbas is that a) they're enormous and b) they never have enough tins within to hold the key spices I use in Indian cooking. The size of the individual tins inside is the first problem. I don't cook Indian often enough to get through large quantities of spices quickly and the pungency does fade. Even in airtight pots, the spices are exposed to the air that is in the pots with them. So I prefer to use small jars and keep the packets of spice (both whole and ground ones) in the freezer, like my ma does. As for the number of spices, yeah, even with the basic ones, these dabbas would have to be about three times as large to be of any use I think. Maybe it's just me, because I know they are a traditional thing, and lots of people love them and use them, Indians included (I assume). But I just don't get them. p.s. I am being pressured to retrieve my TAT from my parents' attic too. But where am I going to put it? My own house is already full of tat. I'm so good at accumulating it! Kavey - How big do these dabbas get then? And I hear you on the whole jar thing, I think I need to revolutionise how I keep spices, big open shelf perhaps? Hi Sanjay from Spice Kitchen here. Love the blog and the post Danny. When you and Zoe are off gorging on Indian grub around East London let me know and I will try and join later in the year. Sorry the tin is a bit stiff, I have sent you an email and hopefully with some light bending you can release some of the vacuum but also keep the spices airtight enough so they remain fresh. Kavey - I completely understand your points and they are not the perfect solution, I think when it comes to storing spices it can be swings and roundabouts! Lets tackle size first. We sell a mid size 19cm tin but you can buy larger tins upto 24 cm ish. Generally though they have 7 pots still and the pot size grows as the diameter grows, not giving you more compartments to extend your range. From time to time you can find 10 pot Dabba's, but they are expensive. Secondly freshness. Your completely right, the freshness does fade and any air exposure will make this happen to any spices, within a jar, tin or elsewhere. We specifically for this reason send our spices out in small plastic bags with resealable tops; many of our customers keep them stored within the plastic packets within the spice tin itself. 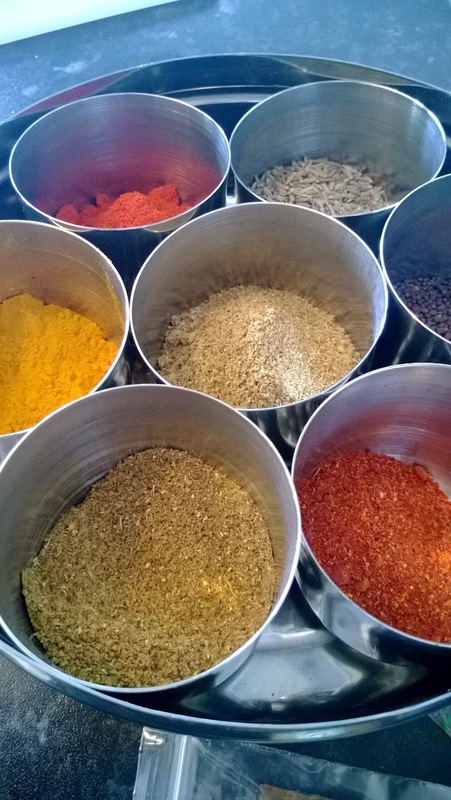 We always recommend that people try and dry roast some of the whole spices where they can to release the smells and oils and then grind them in a pestle and mortar or spice grinder when marinating or cooking. The masala dabba will never be a storage solution for all your spices, if you see my mums kitchen we have 3 cupboards full. However (we think) there is definitely a place in the kitchen for one tin with the key spices tucked inside. Hi Sanjay from Spice Kitchen here. Love the blog and the post. When you and Zoe are off valiganting around East London let me know and I will try and join later in the year. All my spices are close to hand and, imporantly, beautifully displayed and beautiful to behold! 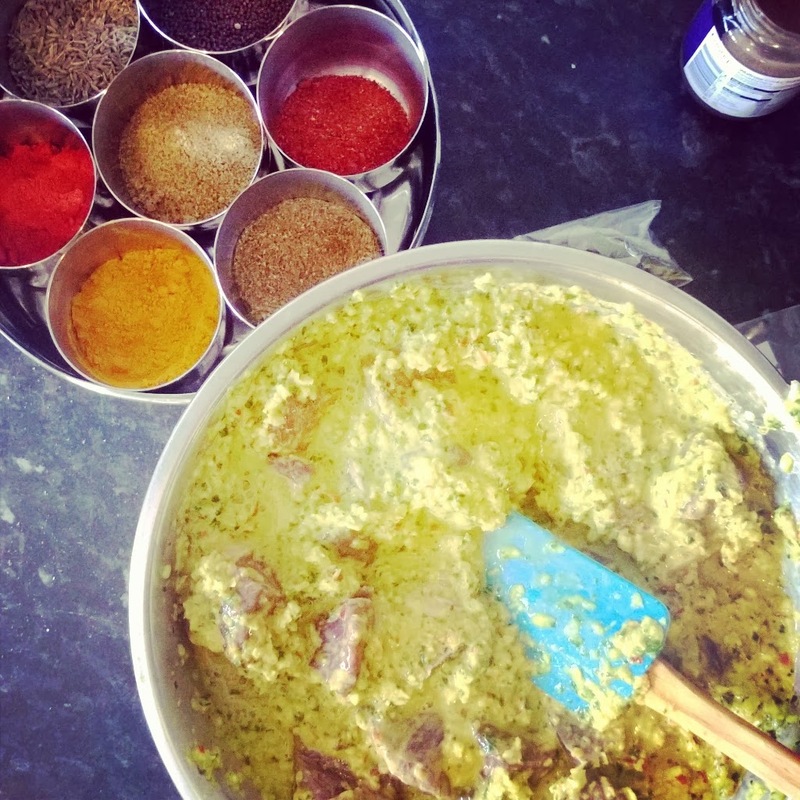 In it are: chilli powder, turmeric powder, roasted and ground cumin seeds, roasted and ground coriander seeds, mustard seeds, cumin seeds and fenugreek seeds. But size is an issue, as Kavey said. I have two dabbas, a smaller and a larger one. The larger one just about fits a smaller bag of spices available in Indian shops (100 g for powereded spices). That's perfect, as it means I can just chuck the bag, and don't need to store it. I bought it after I had my small dabba, because the small dabba was, you guessed it, too small! I still use the small dabba though, e.g. to keep some of the spice mixtures I mix myself, such as panch phoron (Bengali five spice). I do use the spice box often, so don't have problems with spoilage. I also have spices in jars, too, as not everything fits into my dabbas. I could get another large one, and just stack it on top of the other.... In fact, I might just do that! Ana - Stack your Dabbas! It's a new revolution in spice containers/concept/dabbadodah. Stacking Dabbas works well, and then you can fit around a few spice jars around it in order to maximise space. Danny - you need to get people using the word "dabbadodah" when it comes to talking about Dabba's, just love your new word. Also I forget to mention that we have developed another way of storing spices based on some customer requests using magentic interlocking spice jars for your fridge. Link here. I guess the only dabba that would work for me would be one with at least 20 tins inside... and then the round shape wouldn't be practical. Maybe rectangular, perhaps multi-layered with drawers... and then suddenly it's just a different spice box and not a dabba at all. I think fundamentally I'm just not a dabba girl! I got a dabba before i went to Uni and it helped me make friends. Me and my dabba did many a uni dinner party. I ended up leaving it in my last uni residence with little book of recipes that future inhabitants could enjoy and hopefully refill and pass on. I then got a dabba as part of my dowry and it was far too small once my girls came along so that one now holds their little beads and bobs and tut and perhaps they will take it to Uni one day. My current dabba sits on the cooker but like Kavey says it doesn't fit everything I need so I have open shelves with the rest to remind me as I would forget if they were locked away in a cupboard. Three for two in Bina's in Wembley - again part of the dowry and still going! Urvashi - the Uni thing is a great point and I know Sanjay's come across many parents looking to pack their kids off with one. I am also a multiple-dabba-stacker. But a single one is a great comfort if you're going away on hols etc, providing a nice little stater set at least! We are all massive foodies in the office and the steel spice dabbas really hit home with some of us. We rarely use them due to life style, but we would never get rid of the good 'ol steel spice dubbahs! Keep up the interesting and informative and we'll keep visiting Food Urchin.